Observed in a border area of Kakamega Forest, Kenya. December 2014. This weedy composite was observed in sunny forest edge at Kakamega, a lowland rainforest. 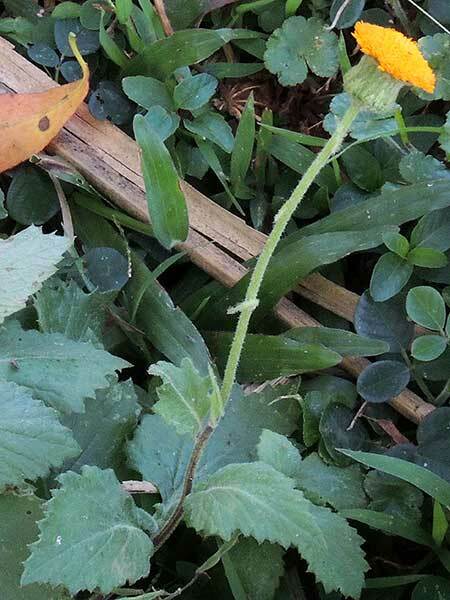 Disc Flowers: The numerous disc flowers are tall and slender with bright orange tubes. 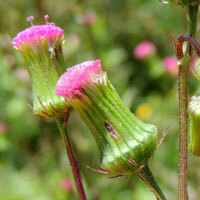 Phyllaries: One series of bracts closely envelopes the florets and developing seeds. Several shorter, aristate bracts. These bracts as well as the peduncles are clothed in soft hairs. Pappus: The seeds are topped by long silky hairs. Leaves: The leaves are simple or sometimes with a pair or two of lobes. The margins are variously toothed.